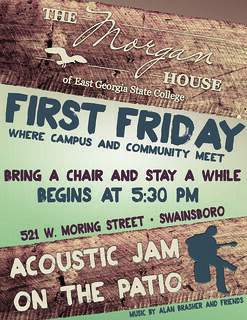 On the first Friday of each month (excluding January and May), East Georgia State College hosts First Friday at The Morgan House, a celebration of campus and community that brings together students, faculty and staff with the community we serve for fun, food, music and art from 5:30 - 7:30 p.m. Art shows are curated by Professor Desmal Purcell and feature everything from 2D to 3D student work, paintings, photography, jewelry, boomerangs, and more. If you're interested in displaying work at The Morgan House during First Friday, contact him at dpurcell@ega.edu to be put on the schedule. Musicians, affectionately known as the EGSC MusicMakers, are coordinated by English Professor Dr. Alan Brasher and welcome any and all musicians of any skill level to join in and sing, play, or even shake a maraca to the beat. Each month, a different EGSC department or group takes charge of providing refreshments and establishing a theme for the events. Angie Williams, Event Planner at EGSC, coordinates the year's rotation. If your department is interested in hosting a First Friday event, contact her at abwilliams@ega.edu.